Today’s blog post is being written from Oslo, Norway. So as the locals say, "Hallo”! We’ve been in Norway for about 5 days but are getting ready to head on the next leg of our trip in Sweden. While we may be many miles away from home, we quickly learned that the love of pizza is an international one. Our first night here was spent eating delicious pizza (although it may or may not have cost $22 for a small pizza). The funny thing is, I made these flatbreads before we left home because I assumed we wouldn’t be eating pizza much on this trip. They were quick and easy after a day of packing and prepping to leave our house for two weeks, and they left us with leftovers to get through one of our last days in town. While I love a good homemade dough, sometimes you just want to keep things simple and buy a pre-made dough. I chose naan, which allowed us to make 4 small personalized pizzas. 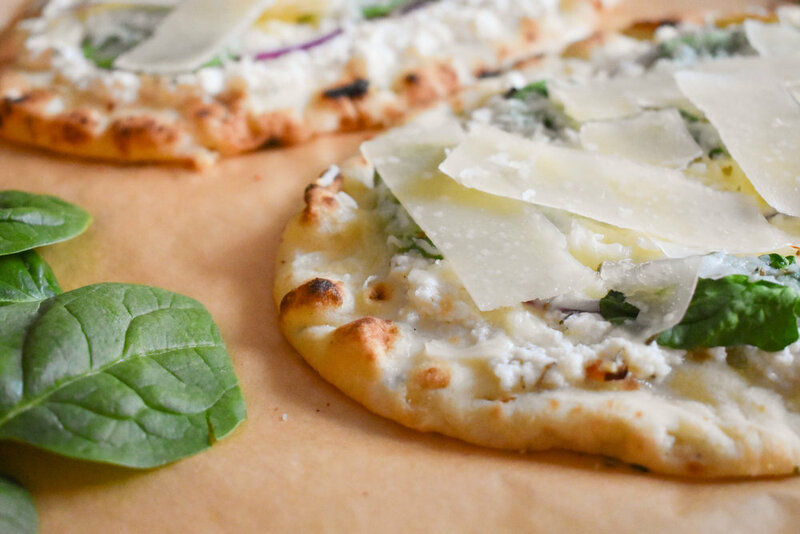 Topped with a garlicky ricotta mix, spinach, red onion, and shaved parmesan, it’s light and delicious. Preheat your oven to 350 degrees and line a baking sheet/pizza pan with parchment paper. In a small bowl, mix together the ricotta, Italian seasonings, honey, red pepper flakes, salt and pepper. Place the flatbread on your pan and brush with olive oil. Spoon the ricotta mixture evenly on the flatbread, leaving about 1/2 inch perimeter around the edge. Top the ricotta with red onion and spinach leaves. Sprinkle the shredded mozzarella over the flatbreads. Bake for 7 minutes or until cheese has melted. Remove the flatbread from the oven and allow to sit for a couple of minutes. Top with shaved parmesan, slice, and serve. *Depending on the size of the flatbread, this recipe will either make one large or two small flatbreads.